Why do we all tend to want to be the same thing each Halloween... a fairy, goolish, or silly? Where does this urge come from? "Wisdom is being aware of your own ignorance"
Looking within yourself what is your intention of the day... a word, an idea, a thought but with every cell of your being hold this intention and allow it to infuse everything you do. In a sense dress yourself up in your intention. You can be anything you want! 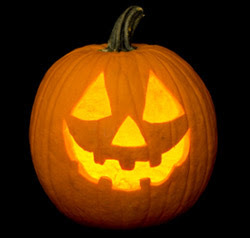 From the inside out glow like a jack-o-lantern!